ELIZABETH VARGAS: In the meantime, the man who threw his shoes at the President is in jail now facing charges of insulting a foreign leader. He could be sentenced to two years if he's convicted. And, although President Bush has made light of the incident, his attacker has become an instant celebrity to many of his countrymen. Here's our senior foreign correspondent, Jim Sciutto. JIM SCIUTTO: One day later, shoes have become a new symbol of anti-Americanism in the Arab world. And the Iraqi reporter who threw them, Muntathar al-Zaidi, a folk hero. In Iraq today, thousands marched in support of his release, and more than 100 lawyers volunteered to defend him. It was a heroic way to say goodbye to Bush, said one Iraqi. Hitting someone with a shoe is a severe insult in the Arab world, suggesting the person is as low as dirt. It's how some Iraqis defiled Saddam Hussein's statue the day Baghdad fell in 2003. It's so insulting, in fact, that some Iraqis are embarrassed. "We Arabs are known for our hospitality," this man said. "Bush was a guest, and guests should be respected." Still, in news coverage, on new fan Web sites, in Arabic text messages, the overwhelming sentiment, giddy satisfaction. A Saudi man offered $10 million for the shoes. JIHAD AL KHAZEN, AL HAYAT NEWSPAPER: He's the most popular person in the Arab world today. This is his 15 minutes of fame. SCIUTTO: Al-Zaidi's act of defiance tapped into wider resentment in the Muslim world against the Iraq occupation, the war on terror, and the U.S. President they blame for it all. Tonight, al-Zaidi's brother put it this way: "Americans have been disrespecting and killing Iraqis for five years," he said. "It's time we paid them back." The shoe thrower himself hasn't lost any relatives, though his family says he was kidnapped once by militants. His cameraman said that just before he got up he handed him this note saying, "It's glorious to die a martyr." He survived, of course, and his story may live on as well. 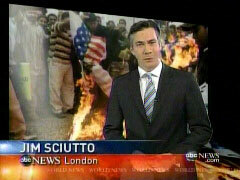 Jim Sciutto, ABC News, London. KATIE COURIC: President Bush is back at the White House tonight after visiting Iraq and Afghanistan over the weekend. A memorable trip, to say the least. In an image seen over and over on TV and the Internet, Mr. Bush had to duck twice during a Baghdad news conference when an Iraqi reporter threw his shoes at him. That reporter is behind bars tonight, but many Iraqis are calling him a hero. From Baghdad, here's Elizabeth Palmer. ELIZABETH PALMER: Deep in Baghdad's Green Zone, the last thing President Bush expected was an air assault. The shoe thrower shouting "this is your good-bye kiss, you dog!" The President shrugged it off. PRESIDENT BUSH: If you want the facts, it's a size 10 shoe that he threw. PALMER: But in the Arab world, Muntathar al-Zaidi, who was quickly dragged away by Iraqi security guards, is huge news. In the Middle East, there's no bigger insult than hitting someone with a shoe, a dirty object worn on the lowest part of the body. By showing the kind of contempt formerly reserved for Saddam Hussein to President Bush, al-Zaidi's become an instant hero. Today, thousands demonstrated for his release. Muntathar al-Zaidi is a local journalist for Iraqi television. He'd been arrested before, in error by American forces. That time he was let go. This time his family's been told he faces years in jail. "May God protect him" prays his sister while his nephew threatens retaliation against his jailers. There was more support on a Baghdad call-in show from Iraqis furious with President Bush in what they see as a botched U.S. occupation. On the Internet, shoe humor went viral. Al-Zaidi should do jail time, said the Iraqi bloggers, because he missed. 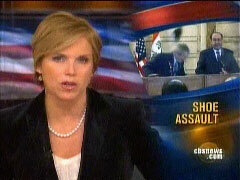 Elizabeth Palmer, CBS News, London.